Green European addresses the quest for a better understanding of European type(s) of environmentalism. This monograph focuses on public attitudes and behaviours and the culturally rooted as well as country specific differences. 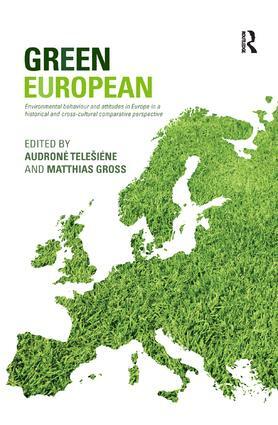 The book addresses the wider issue that many European countries are rendered ‘green’ or as having an advanced environmental awareness, but the question - ‘how green are Green Europeans really’, is yet to be answered. the third discusses environmental attitudes, environmental concerns and their imminent link to personal pro-environmental behaviour. The empirical comparative nature of the contributions is enabled by data from the International Social Survey Programme (ISSP). Empirical, and methodologically sophisticated, this excellent volume is the first systematic comparative study of environmental attitudes using the ISSP in over two decades. It explores with great insight environmental attitudes and behaviour in Europe and elsewhere. Firmly based on data from international social surveys, this volume provides a varied and fascinating overview of European environmental perceptions, attitudes and actions. In applying insightful interpretations on a rich collection of available data, it fills a major gap in our understanding of how Europeans think and act about environment. Moreover, the contributions to the book represent a truly European-wide set of analytical angles to the social dimensions of environment. Highly recommended, both as an indispensable resource for further scholarly research, and as a source of inspiration in grasping the complex dynamics of citizen environmental concern. Dr. C.S.A. (Kris) van Koppen, Associate Professor Environmental Policy at Wageningen University and former Chair of the Environment & Society Research Network of the European Sociological Association. Audrone Telesiene is Associate Professor of Sociology at the Institute of Public Policy and Administration, Kaunas University of Technology, Lithuania. She is member of the national team implementing the International Social Survey Programme (ISSP) in Lithuania. Her research interests include environmental sociology, sociology of science and technology, risk communication, social change and social analytics. Matthias Gross is Professor of Environmental Sociology at the Helmholtz Centre for Environmental Research, UFZ, in Leipzig, and the University of Jena, Germany. His recent research focuses on public perceptions of renewable energy, ignorance and security, real-world experiments, and the changing role of civil society in environmental policy.